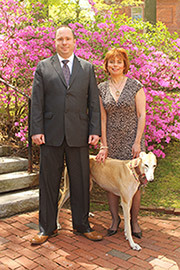 In recent years GREY2K USA Board Member Charmaine Settle has investigated greyhound racing in several parts of the world, including Vietnam, Macau, New Zealand and Australia. 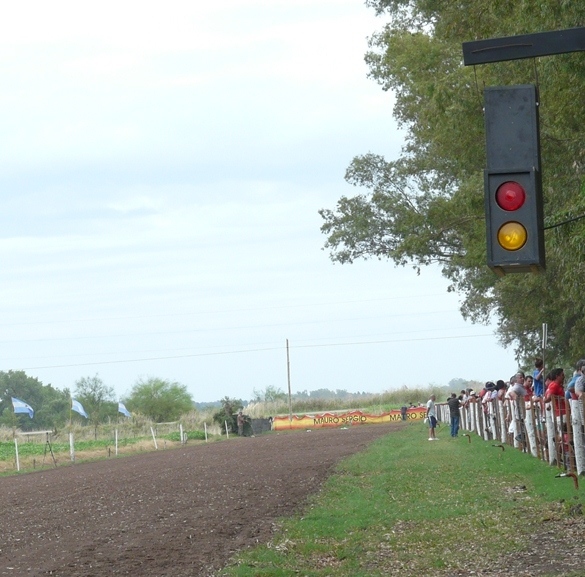 This February she explored dog racing in Argentina. Below, you will find excerpts from her report. Please also check out this slide show of photographs she took while she was there. "On February 17 I hired a car and driver to take me from a hotel in Buenos Aires into the countryside to the city of Navarro. The Navarro Galgo Club was having a Sunday meet, off a secluded dirt road which proved difficult to find if you didn't already know its location. This was a non-commercial, organized meet in the middle of a field on a small, homemade track. We were told these informal galgo races took place in the countryside year-round on Sunday afternoons, changing geographic locations each week with different galgo clubs involved." "After paying admission, we drove into the event which seemed like a neighborhood barbecue on a sunny Sunday afternoon with family, friends and, of course, galgos. The people were friendly as my husband and I strolled around the grounds, although no one spoke English. Most people had brought a small number of dogs to race in a straight track in the middle of a field. The overall feeling was that these dogs were a simple hobby to the majority of owners, an easy way to make a little extra money on the weekends. The field's surface looked surprisingly good with soft dirt which was sprayed down with water after each race. Around three hundred spectators of all ages stood at the railing and watched the races, which were scheduled to take place between noon and 3:00 PM, with the youngest dogs competing first." "As many as twelve dogs competed in each race. The track had a Stop and Go light on the side of the field and camera box at the end. There was no cable system but instead dogs chased a paper bag on a string. Before each race the dogs were paraded around a small fenced area so people could view them and place bets on their dog of choice. Meanwhile, a man who sounded like an auctioneer was shouting out in a non-stop, strong and loud voice the specifics of each dog who was about to compete. The names and numbers of the dogs were hanging on a chalkboard attached to a tree. Bets were made between people attending the races, or against the Club itself. 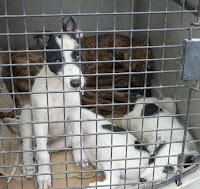 After the wagers were made, the dogs were taken to the starting boxes." 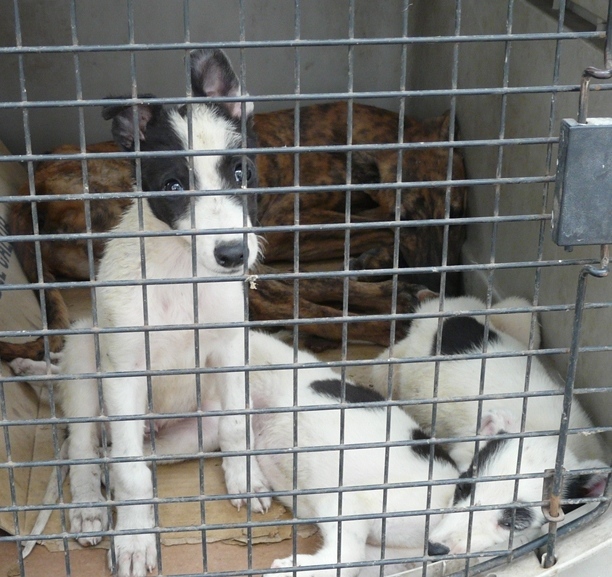 "We were told the dogs raced until they were five or six years old, and some were used for breeding after that. The disposition of the remaining dogs was unclear, and no one would give us a straight answer. 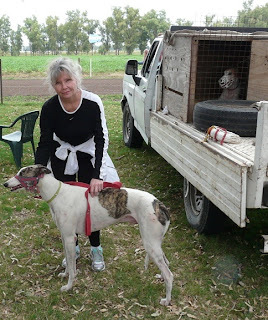 We were later told that galgos are highly desired by Argentinian ranchers, who use them for field work." "In a few cases we saw people who treated their dogs kindly, but many of the owners physically reprimanded the dogs. In response to any behavior they did not like, the owners would raise their hand over a dog's head and strike them with a blow to the face via hand, leash, or muzzle. It appeared the rationale was that a strike on the face would not damage their running body. It hurt me to witness these dogs being struck. In most cases, no affection or attention was shown to the dogs. They seemed to be invisible to the owners, just a thing to hopefully bring in extra money." "The most troubling behavior was seeing individuals cram their dogs into the trunk of a small car for transport, as opposed to others who at least had makeshift wooden box trailers behind their vehicles, or just let them ride in the backseat of their car. 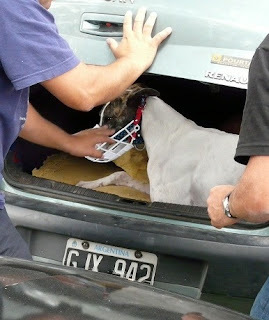 These individuals would transport the dogs from their home to the meet in the car trunk, leave several dogs in the trunk until their race began, then push them back into the trunk after the race was over. The dogs would be left there for hours while the owner went into the crowd to enjoy the barbecue." "I also saw puppies for sale in cages, just staring out as they were about to start their new life of misery, neglect and ultimate death. I worry that the outlook here is grim, with these race meets potentially continuing for many years as they are passed down from one generation to the next." Even though this is not the large-scale commercial dog racing we are most familiar with, these informal races do raise serious questions. It's also important to remember that there is a longstanding relationship between these races and commercial greyhound breeders, with at least some former race dogs being sent to Argentina. As always, we are grateful for Charmaine's reporting of this important issue. Her work is one of the many reasons why I am proud to serve as Executive Director for GREY2K USA. What a shame do Argentinians. Such heartless people also exist on this planet its a shame to tell. And there are the audience also to enjoy the race, its awful. And then there are the heroes like Charmaine who help these living creatures Thank you so much GREY2K USA guys for taking steps to stop this and let us aware about it.